There is a constant theme in the financial media that this Bull Market is about to end any day now. I believe it still has a long way to go. It’s not going to continue straight up and we’ll experience plenty of corrections along the way. Ultimately, it will end with a “blow off” move to the upside where everyone just throws in the towel. I don’t know if this will happen three months or three years from now, but I am leaning towards the latter because it will take a long time for investors to change their mentality. I’m basing my thesis on technicals, fundamentals and investor sentiment. (I could write 10 pages on each of these topics but I will do my best to focus on the major points). Technicals – Weekly volume is important to monitor because the big funds control the market. The major indexes continue to show that institutions are accumulating stock. For the most part, they are buying stock on the positive weeks and selling very little on the down weeks. This isn’t limited to the US markets. The global boom is being confirmed by new highs in many international markets. In the US, the leading growth index is the Nasdaq 100 and you can see in the chart below that it JUST broke out in July 2016 after going nowhere for almost 17 years! Fundamentals – The Bears’ biggest argument is that the market is overvalued. Stop with this nonsense! If you factor in the low interest rate environment, we’re trading at a reasonable valuation. If you take out Energy, the market is actually cheap! Also, the market is a discounting mechanism and trades on what will happen 6-9 months from now. Within the next two years, the economic stimulus from the new administration will help earnings grow and justify valuations. In addition, many Mega Cap companies have strong balance sheets with $20-$300 Billion in the bank. Not exactly a bubble, but I will get into this later. Sentiment – Everyone hates this market! Even the Bulls I speak to are nervous and have one foot out the door. This constant fear is helping to drive the market higher, as many people are underestimating the power of psychology in fueling market rallies. For a while, I’ve been writing about this consistent psychological pattern in the market: An event (usually with a finite date) is over-hyped by the financial media. Since everyone is already nervous, there’s a huge rush into put hedging, shorting stocks, and buying toxic VIX products, etc. The event turns out to NOT be the end of the world and the market grinds higher, forcing many to cover their short positions and/or put cash to work. Think of everything that’s been thrown at this market over the past few years: geopolitical concerns, dramatic elections, viruses, Brexit, terrorist attacks, etc. and guess what? The market has been INCREDIBLY resilient and literally brushes off any bad news. Now, imagine if the news over the next year or two actually turns positive. I realize the media hates Trump and will never say anything positive about him, but imagine if his team actually makes progress in tax reform, health care and the overall economy improves. This could move GDP growth from around 1% to 3% and S&P earnings can increase to $140-$150 over the next two years. Again, no one wants to consider anything positive but remember two things are almost always true: 1) The world keeps getting better and 2) The people always think it’s getting worse. 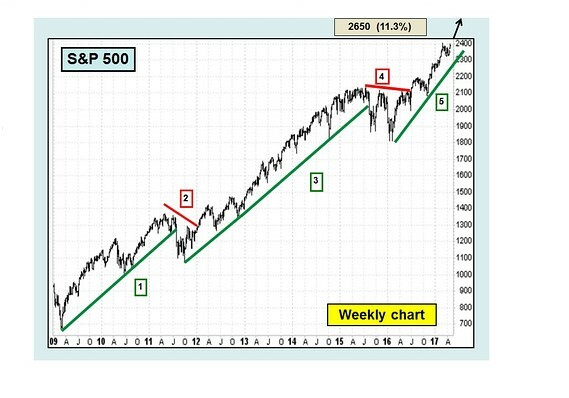 For the past 100 years, the market’s pattern has been approximately 15-20 years of an economic boom followed by 10-15 years of a downturn or consolidation. This current cycle looks to have started with the new highs created in 2013 and could last for many years. These cyclical uptrends are usually led by new inventions that revolutionize our lives, enhance productivity, and completely change the way we do things. The new ingredient that could really add fuel to this rally is the global economy. Many companies continue to expand internationally and are seeing explosive growth overseas. We are no longer just a domestic economy as we were in the past. One sector I am specifically focusing on is the Semiconductor group. Chips are no longer just going into computers. They are found in smart phones, cars, watches, memory, sensors, machine learning, artificial intelligence, etc. The “Internet of things” is the inter-networking of all these devices and experts estimate that we will see over 50 billion connected objects by 2020. If you study the biggest stock winners throughout history, the majority of their moves end with “blow off” or climax tops. This usually involves a period of days or weeks where the stock gets extremely extended in price, sees several technical gaps, and ends with its largest point move of the entire advance. As I mentioned before, many of the Mega Cap growth leaders such as Apple, Amazon, Facebook, Home Depot, Google, Netflix, Salesforce and Priceline have a tremendous amount of cash in the bank. In addition, you rarely see companies with $50-$700B market caps growing at such amazing rates. Combine that with the Large Cap Financial stocks that have strong balance sheets and you have a potential recipe for higher prices. At some point in the next few years, I wouldn’t be surprised to see “blow off” type moves in many of today’s growth leaders. Another factor to consider is there are fewer stocks to buy. The number of publicly traded stocks has dropped from approximately 7500 in the late 1990’s to under 3800 today. This is the result of more M&A, less IPO’s due to stricter regulations, and a more liquid private market. As money flows into the market, fund managers have fewer stocks to chose from and lower floats to work with because of all the corporate stock buybacks. In other words, less supply and more demand. There are two final points I would like to make: 1) I am not a blind bull. If I am wrong about this call, I will simply cut losses because capital preservation is ALWAYS the number one priority for my clients. One of my biggest strengths is the ability to make decisions and change my mind when market conditions call for it. 2) If I am right about this call, this could be life changing! You will need someone who can capitalize on this move, especially if your financial advisor is bearish and doesn’t have you positioned properly. If you are looking for a money manager or would like to set up a FREE consultation, please email me. My skills at finding growth stocks and my 20 years of trading experience will allow me to take advantage of this rare, generational investing opportunity. Which looks to be headed lower over the next few days at least. This is the first opportunity I have had to look at the market for about 1 week. I have been busy moving house. This is a very tiring and stressful undertaking. Chaos reigns. At the moment mostly everything is still packed in boxes. As to the market, overall, it would seem to have lost upside momentum and now will have a period of weakness. Having quickly looked at the various commentary around, much is attributed to Trump etc. Also mooted is the high P/E ratio etc, with market near all time nominal highs. If already long, stay long and ride out the volatility. If not in the market, this could provide an entry point. I would not be short, unless you can manage the position on a daily basis. I think the ‘shorts’ will have some time to make a bit of money, but if the market turns higher, then it will likely move higher with higher volatility. Totally ignoring all of the media stories, fundamentals, anything other than the 3 charts, the charts would suggest that for a long while since 2000, the market has gone essentially nowhere until the current breakout. The charts would suggest that the breakout has a long way to run yet. In fact, it is just getting started. I’ve blogged about the eventual breakout previously and recommended hanging on, which I still would advocate, purely on a chart basis. The important thing is that the ‘news’ around the breakout, as it was historically, is usually bad. There are all manner of problems. Hang on, somehow.